1. Scholarship - We expect you to diligently pursue your degree and will assist you by providing a support system and scholarships for those who earn good grades. 2. Character - We expect you to act responsibility and with integrity, and to be accountable for your actions. 3. Leadership - We expect you to expand your leadership skills both through TKE and other campus activities. 4. Teamwork - We expect you to be engaged in the activities of the fraternity and support other members in their endeavors. 5. Service - We expect you to experience the sense of fulfillment that comes from supporting our university and the community through service projects and philanthropy. 6. Brotherhood - We expect you to get to know all members and build relationships that will last a lifetime. You will also be able to network with over 1400 TKE alumni. How Much Does it Cost to be a TKE? Candidate Fee $75 (one-time) This provides candidate members with a copy of The Teke Guide to learn about the history, values & traditions of Tau Kappa Epsilon. This fee is paid within two weeks of accepting a bid. Initiation Fee $225 (one-time) This fee grants you full privileges of membership in Tau Kappa Epsilon. It is paid prior to initiating, which is generally six to seven weeks following acceptance of a bid. Chapter Dues $650-$750 (yearly) These dues cover a variety of fees that must be paid to headquarters & funds for the local chapter to cover various expenses like social events, homecoming activities & intra-mural entry fees. Non-Resident House Fee This fee is paid by members who elect not to live in the TKE House. These fees help cover the maintenance costs for the common areas like the chapter room & the grounds. In the 2018/2019 schoolyear, this fee is $100 per semester. Thanks to the generosity of our alumni, scholarships are currently available for members who live in the house and whose GPA’s exceed 3.00. The scholarships range from $750 to $1000 per year, depending on GPA. 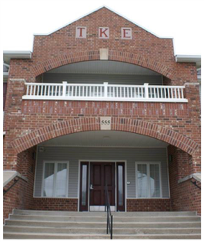 Located next to the campus at 555 W. Ninth Street, the TKE house/property is the largest fraternity property at Northwest Missouri State. There are 8 living suites, each consisting of 2 large bedrooms and a shared bathroom. The common areas consist of a commercially furnished kitchen, a television lounge, a games area with a pool and foosball table, a 30x60 foot chapter room, a study area and washer/dryer facilities on both the first and second floor. There is also a large deck with views of the campus. Outside the house, there is a large parking lot which can accommodate several dozen vehicles, a patio with a grill, two basketball goals and a sand volleyball court. Adjacent to the property is a large field on which football, soccer or kick ball can be played, next to which is a baseball/softball field which is city owned but often available for use. Both the TKE House and the property are alcohol and drug-free. While we do not prohibit members from drinking away from the TKE House, we feel that the focal point of the fraternity should be our six principles rather than alcohol. People who wish to smoke or vape must do so outside. An adult lives in the house year-round to help ensure that rules are followed and safety is enforced, and alumni advisors visit the house at least once per week, often unannounced. 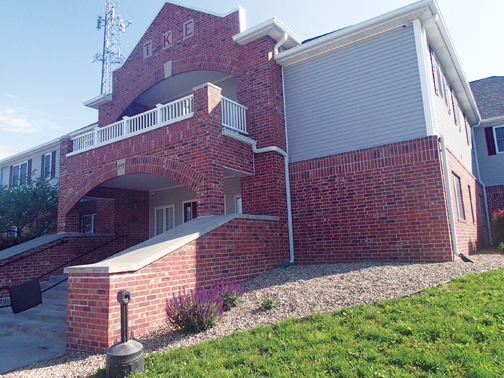 Costs include all utilities for both the TKE House and the dormitories. Parking is free at the TKE House; university permits cost $160 per year.